Contest Winner! The winner of the Zen Yarn Garden yarn is Jenn from Winnipeg. Congrats Jenn, and thanks again to Roxanne of Zen Yarn Garden. Socks for Soldiers:Â Anne Kennedy, Reference Librarian at Licking County Library, Newark, OH gives us a glimpse into history. She writes about the initiatives to knit socks for soldiers during the US Civil War. Â Bonus: she includes a pattern for socks as printed in Scientific American magazine in 1861. Really! 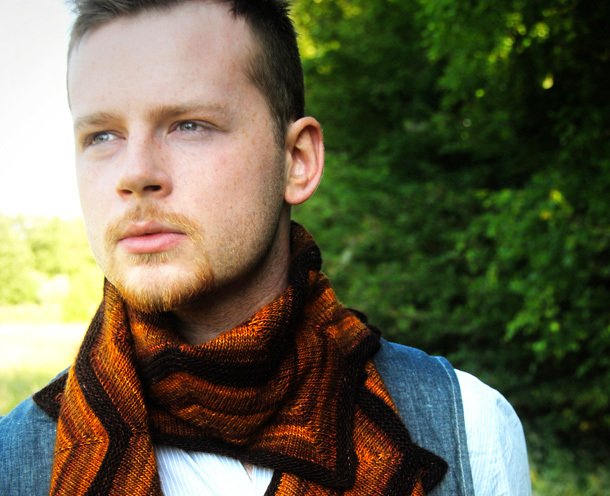 Designer, knitter and all-around good guy. Knitty contributor and all-around fabulous knitter Stephen West has announced a day of events in New York City, October 19th: there will be book signings, a trunk show, and a full day of workshops. Details here. Things we love part one: Nicky Epstein has launched a club… a year’s worth of exclusive patterns and other goodies from this excellent designer. Brilliant and silly in equal measure. A retired Reverend and her sister are knitting little “church mouse” toys to sell to raise funds for much-needed improvements to their local church facilities in King’s Fee village in Wales. So far they have knitted and sold over 600 of the creatures. They are also hosting a photo contest, seeking photographs of their mice in exotic or unusual locations all around the world. Charming non-knitter photo-op alert: Niall Ã“ Donnghaile, Lord Mayor of Belfast, is photographed with knitting needles and yarn as he meets a group of very lucky knitters travelling around Ireland as part of a knitting retreat hosted by designer Maggie Jackson. Things we love part 2: our friends at Soak have just launched a new line of knitting-themed temporary tattoos. They were rolled out at the recent Vogue Knitting Live show in LA, with great success. The article about socks for the civil war soldiers was interesting. The smallest needles I have used so far is a 1, so 00000 really impresses me. Especially, if you are using that size and still cranking out 3 pairs a week!! Those ladies rock! Thanks for sharing. Now of course we all want to buy some church mice../is there a way to do so from the US???? Cosbysweater in Cosbysweater in Cosbysweater … Brilliant! Must share this with himself, who insists on still wearing his Cosby sweater (not when he’s out with me). I knew about the socks for soldiers during the war. I even heard that if a knitter didn’t make them fast enough. They were asked to give the yarn to a quicker knitter. I think a sock pattern from that time would be really interesting. Re the tattoos: Is “Quivet” a cross btw a civet and Qiviut? Sorry, couldn’t hold the spelling snark in. It was unfortunately overlooked when we proofed the design. We didn’t notice until we actually had them in our hands so it will be fixed on our next batch. The Cosby sweater is still awesome. I saw it on Craft, but it hasn’t lost its impact at all! I’m confused by the article about socks for soldiers. The Scientific American pattern is for a 78-stitch sock, which would presumably have a gauge of 8-9 sts/in. The pattern also specifically requires “large needles and a coarse yarn.” However, the author then goes on to describe socks knitted with fine needles and fine yarn at a gauge of 8-15 sts/in. The author appears to see no difference between the heavier boot socks that soldiers would need and finer socks/stockings for everyday wear. Or she can’t do math. Or she isn’t a knitter. Or her editor made a hash of what used to be a longer, more informative article. Or all of the above. I actually wrote the article. This has been part of a year-long series of American Civil War stories put together by the library. The newspaper has limited our articles to 500 words which can make it difficult to say everything you want to say. I appreciate the fact that the sock pattern listed has a larger gauge than the average fine sock knit during the Civil War. I am a knitter so I do understand the difference in gauges. If I had more room in the article, I would have explained that. However, I thought my local knitters (and not so local apparently!) would appreciate seeing a historical pattern to understand how brief some of them were. Other patterns were longer but that meant I would not be able to do any sort of comparison between historical and modern knitting. Also, because my primary audience for the article are non-knitters and I was limited by space, that note was left out of the article. If you would like more detailed information about historical knitting, there are absolutely fabulous books, magazines and patterns out there (don’t forget to check out Knitty, of course!). Just a polite reminder that our words online can echo a far distance. Just saw Andrew Salomone’s “Cosby” sweater at the Museum of Arts and Crafts today in NYC – so fun to look up on a display and see some spectacular knitting! Our Craftsy classes…special half-off links for Knitty readers!